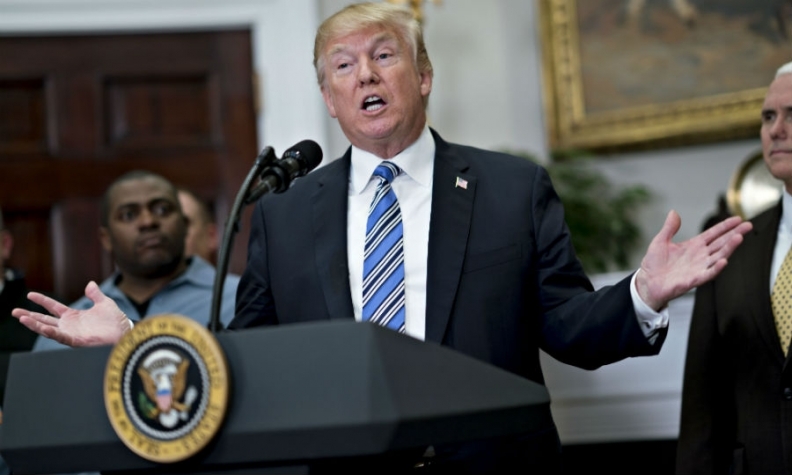 WASHINGTON — The Trump administration on Wednesday launched an investigation into whether tariffs are needed on the imports of automobiles into the United States, moving swiftly as talks over the North American Free Trade Agreement have stalled. President Donald Trump predicted earlier that U.S. automakers and auto workers would be "very happy" with the outcome of the NAFTA talks. The new probe would determine whether lost domestic production had weakened the U.S. "internal economy" and its ability to develop connected vehicle systems, autonomous vehicles, fuel cells, electric motors and batteries, and advanced manufacturing processes. In a statement, Trump said: "Core industries such as automobiles and automotive parts are critical to our strength as a Nation." "To our knowledge, no one is asking for this protection. This path leads inevitably to fewer choices and higher prices for cars and trucks in America,” said John Bozzella, chief executive of Global Automakers, a trade group representing Toyota, Nissan, Hyundai and others. The U.S. remains far apart on the talks over rewriting the trade pact with Canada and Mexico, with the discussions at an impasse over rules for car production. The initiation of the trade investigation could be seen as an attempt to gain leverage in the talks with the two U.S. neighbours. Treasury Secretary Steven Mnuchin has said that efforts to renegotiate the trade agreement could spill into next year. At the same time, the United States exported nearly 2 million vehicles worldwide worth US$57 billion. The Trump administration used that authority in March to slap tariffs of 25 per cent on imported steel and 10 per cent on aluminum imports. Until then, the United States had pursued only two such investigations since joining the World Trade Organization in 1995. Both times — in a 1999 case involving oil imports and a 2001 case involving iron ore and steel imports — the Commerce Department refused to recommend sanctions. "I do not believe that it will have the desired effect," Ujczo said. "Everyone knows that [the investigation] will take too long and has no chance of surviving any legal challenge." "I am not happy with their requests. But I will tell you in the end we win, we will win and will win big," Trump said before departing for New York. He said America's neighbours have been "very spoiled because nobody's done this but I will tell you that what they ask for is not fair. Our auto workers are going to be extremely happy." Trump has sought to overhaul NAFTA in an effort to return auto production to the United States and reduce America's trade deficit. The U.S. has been demanding that a percentage of a car's content of auto parts originate in a country — the U.S. or Canada — with average auto worker wages of about US$15 an hour to qualify for NAFTA's duty-free status.